Large Sakhalin shishamo smelt with tender roe inside. Simply defrost, remove straw, grill, and enjoy. These smelt are more than 18% roe by weight, and are sure to leave you feeling satisfied. 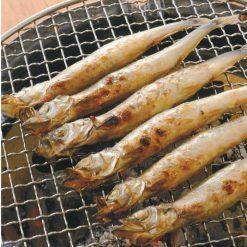 Among all Sakhalin shishamo smelt caught, only 1~3% are this large; making these particular fish quite rare. We consider any Sakhalin shishamo smelt bigger than 22g to be “large.” Many “large” commercially available Sakhalin shishamo smelt are 15g to 19g. 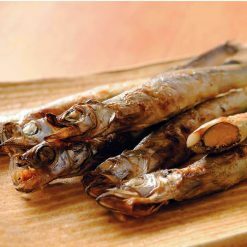 In addition, many commercially available Sakhalin shishamo smelt are dried insufficiently so that they are heavier and appear larger. When the Sakhalin shishamo smelt used in this item are dried at a rate of less than 70%, you have our assurances that they have been dried thoroughly. Defrost for 2 to 3 hours in the refrigerator. Then, remove the smelt from its straw and grill it on medium heat in the oven, turning over as needed. Cook until light grill marks have appeared on both sides of the fish.Because fish spoils easily and can be daunting to prepare at the end of a long day, many people avoid cooking it at home; but since this smelt with roe needs only to be grilled it can be served quickly and effortlessly, and is completely mess-free! This product contains sakhalin shishamo smelt (Norway), table salt.. Origin of ingredients: Sakhalin shishamo smelt (Norway, Iceland). Prepared and packaged in Japan.